Viktor Yushchenko on the stage in Maidan Nezalezhnist (Freedom Square) with pop singer Ruslana and Vitaly Klitschko. 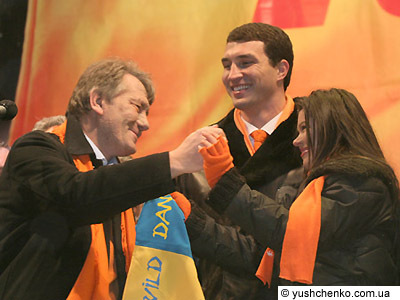 The famous Ukrainian boxing brothers Wladimir and Vitaly Klitschko declared their support of the democratic movement and (then) candidate Yushchenko during the Orange Revolution. The Ukrainian Institute of America is presenting Vitali and Wladimir Klitschko The Persons of the Year - 2004 Award on March 8, 2005 at a Gala Banquet at the New York Hilton Hotel. Tickets are still available for the Gala Banquet, so if you are planning to attend please call the Ukrainian Institute of America at 212 288-8660 to order your ticket. March 4, 2005 is the last day to order tickets. Call today to order your tickets!